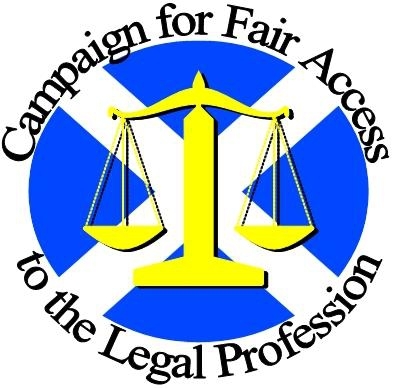 The Campaign for Fair Access to the Legal Profession (CFALP) is a national campaign being run by law students at Scotland’s Universities. We are concerned that the current government funding for students who want to be lawyers excludes those from less privileged backgrounds. We are campaigning for the Scottish Government to extend means-tested student loans for living costs to students undertaking the Diploma in Professional Legal Practice (DPLP). A summary of our aims and arguments is here. Updates will be posted on this blog. Feel free to explore the website for further detail and background. A recent survey of students on the DPLP confirms that, despite recent changes, student support is failing help those from less privileged backgrounds studying to enter the legal profession, meaning those entering the profession are overwhelmingly drawn from Scotland’s richest families. 79% of students responding to a survey of those taking the DPLP at Edinburgh University were from the richest 40% of the country; only 7.5% from the poorest 40%. In comparison, the equivalent figures for those starting law degrees in Scotland are 57% and 27%. This demonstrates that the DPLP funding gap is cutting off access to the compulsory fifth year of study, and therefore the legal profession, for many law students from less privileged backgrounds. Even with wider availability of the limited student support package, 92% of respondents in the Edinburgh University DPLP student survey were still primarily or substantially reliant on family support or personal savings to fund their studies. This clearly highlights the hurdle faced by those to whom this support is not available. The survey of DPLP students confirms that those studying to enter the legal profession are overwhelmingly drawn from Scotland’s wealthiest families. There is also a clear drop-off in participation by less privileged students between study of law at undergraduate level and the DPLP. This evidence backs up campaigners’ claims that the funding arrangements create a financial barrier cutting off access to the legal profession for many of those from less privileged backgrounds. When the diploma was introduced as a compulsory part of the route to qualification, the fees were covered by a grant and there was a means-tested maintenance grant to assist those from less well-off backgrounds. Today, there is no assistance at all with living costs, even for the poorest students, whilst a student loan towards fees is capped at £3,400 – around half the actual cost. The Scottish Government rightly prides itself on its record of access to undergraduate education where it promises that students should not pay fees and provides over £7,000 a year in maintenance loans to assist students from the poorest backgrounds. This support is extended to all five years of study for those entering other professions, including medicine, dentistry, veterinary medicine, engineering, architecture and teaching. But this contrasts starkly with the arrangements for support to diploma students. So it is hardly surprising that aspiring lawyers whose parents or family do not have the money to help them bridge the £10,000 funding gap find they have little hope of converting a law degree to a legal career. The results and analysis of the three topics covered in the survey are reproduced below. A PDF copy of the report is available for download here: 20130404 – CFALP Survey of UoE DPLP Students – Final. 79% of the DPLP students surveyed were drawn from the 40% least deprived in Scottish society, as measured by the SIMD index. This is more than ten times the proportion (7.5%) from the 40% most deprived.4 Those from more deprived backgrounds are under-represented at undergraduate level (making up only 25% of those commencing the LLB, rather than around 40% if participation rates were equal) but the drop-off between 25% and 7.5% starkly demonstrates that most of those from more deprived backgrounds who commence the LLB do not progress to the DPLP. Without a DPLP they cannot move from studying law to entering the legal profession. It may be argued that those from more deprived backgrounds are less well represented on the University of Edinburgh’s (UoE) LLB, so this increased exclusivity may be reflected in the DPLP at the same institution. But participation rates for those from more deprived backgrounds still drop by almost half between the rates on the UoE LLB (14%) and the DPLP (7.5%). The figures should be going the other way as the UoE is one of only 6 institutions providing a DPLP (teaching around 25% of DPLP students), compared to 10 providing the LLB (teaching 12.5% of LLB students). All 4 of the LLB universities not providing DPLPs have higher participation rates for those from more deprived backgrounds than UoE, so students from these institutions moving to DPLP study at UoE should, in principle, improve the UoE participation rates at DPLP level. A further argument is that the UoE DPLP fees are towards the higher end of the range of fees charged by institutions5. In fact, UoE is the only of the DPLP providers to offer a formal bursary scheme for its DPLP students. Over 30 students received support. This made the UoE DPLP in 2012/13 one of the most accessible courses as far as fees are concerned. DPLP students were asked to indicate which funding sources had made a significant contribution to their fees and living costs for the year of DPLP study. Those who indicated a Postgraduate Tuition Fee Loan (PFTL) contributed to their costs were asked whether the PTFL had been critical to their ability to undertake the course or whether it had merely been helpful but they would have found a way to fund the course were it not to have been available. The survey revealed that an overwhelmingly majority of DPLP students receive a substantial contribution towards their costs from parents or family. When combined with those making a substantial contribution from personal saving, likely to be mostly mature students with savings from a previous career, this rose to 92% of students. This highlights the financial barrier facing those without families able to afford to make significant contributions to the cost of study. The statistics also demonstrate the lack of effectiveness of the PTFL. It does help some students (33% of all students indicating they could not have taken the course without it) but the vast majority of these were still also reliant on significant contributions from family, parents or personal savings. Only 2% of students were enabled to study the course by the PTFL despite lacking a significant contribution from family or personal savings. In contrast, 68% of students did not need a contribution from the PTFL to undertake the course (including 1 in 3 of those actually taking the PTFL). This clearly demonstrates that the £3,400 cap on assistance prevents a significant proportion of graduates undertaking the DPLP as they cannot bridge the funding gap. DPLP students were also asked about their educational route to the DPLP. Students can achieve the necessary academic qualification either through an undergraduate law degree (LLB) or the Law Society of Scotland Examinations. The results indicate that the social profile of the profession is not improving. The figures tend to suggest the profession is becoming more exclusive but, given the small changes seen, the relatively small numbers surveyed by the DPLP survey and the roundings employed in the presentation of the 2006 data, it is not possible to state this with certainty. In contrast, the route to qualification is clearly becoming almost exclusively through an undergraduate law degree. The decline in those taking the Law Society of Scotland examinations may be due in part to the increased availability of part-time undergraduate law degrees. It may also reflect the fact that, over recent years, a significant social and political premium has been placed on encouraging all those with the aptitude to take up a place at University. This may have the effect of reducing the numbers of those deciding not to go to University but rather to learn their profession through entering legal employment straight from school. 1Responses which declined to state a full postcode or where the postcode was not in Scotland were disregarded. 2For more information on SIMD, see http://www.scotland.gov.uk/Topics/Statistics/SIMD. Each SIMD datazone has an approximately equal population so, if representation was equal across the deprivation levels, 20% of students would come from each quintile and 40% each from the 40% most and least deprived areas. 3Sourced from NUS Scotland by FOI request to the Scottish Funding Council. 4If participation was equal across the social spectrum, 20% of LLB and DPLP students would be drawn from each SIMD quintile. 5For 2013/14, fees and compulsory material costs vary between £5,995 and £6,995, dependent on institution. 6A median cost for fees and materials is £6,500. Living costs will depend on individual circumstances but the Scottish Government’s ‘minimum income guarantee’ for students, used to set the maximum loan for undergraduate living cost loans provides a conservative estimate. It is £7,250 for a year of study. Deducting the maximum PTFL of £3,400 leaves students with a funding shortfall of £10,350. 7The 2006 and 2010 reports are available at https://www.lawscot.org.uk/about-us/equality–diversity/the-society/published-research. The 2010 report used different occupational categories and it was decided to use the 2006 categories as the comparator. 8The categories of ‘Professional’, ‘Executive’, ‘Management’ and ‘Legal’ were taken to be ‘white collar’. The categories ‘Skilled’ and ‘Unskilled’ were taken as ‘blue collar’. Those categorised as ‘Unemployed’ (2% or less in any measure) or ‘Parent or Full-Time Carer’ were disregarded. Only Father’s occupation was considered. It will immediately be apparent that this process is crude and relies to a certain extent on social stereotyping. Figures obtained by CFALP show that, in contrast to the Scottish Government’s prediction that ‘approximately 400’ additional law students would benefit from the increased availability of loans under the newly introduced Postgraduate Tuition Fee Loans (PTFL), only an additional 20 students received loans. In August last year, CFALP wrote to the Cabinet Secretary for Education asking him to reconsider his decision not to extend student maintenance loans to DPLP students. His response was that ‘limited resources mean that we are not able to reintroduce student loans for living costs to DPLP students, rather we have chosen to use the money available to support more postgraduate students in meeting the cost of tuition fees’. He also explained that, under the new Postgraduate Tuition Fee Loan (PTFL) system ‘around 5,000 full and part-time’ could benefit from assistance towards fees. His colleague, Dr Allen, stated in Parliament on 20 September 2012 that ‘approximately 700’ law students would be included in these figures, a predicted increase of 400 on those who benefited under the previous Postgraduate Student Award Scheme (PSAS) grant towards fees. However, figures obtained by CFALP have shown that only an additional 20 students benefited from PTFL compared to the 300 grants available under the previous PSAS scheme. This pattern appears to be repeated across other non-DPLP courses funded by PTFL with only a total of just over 1500 PTFLs taken up, according to Scottish Government statistics, compared to the 2,700 grants under PSAS. This is in contrast to the predicted increase to 5,000. Taken with the recent evidence on the lack of socio-economic diversity amongst DPLP students, this evidence confirms the PTFL has made little or no impact on widening access to the DPLP (or, it would seem, to postgraduate education as a whole). It is simply too low in value to make a meaningful difference to those who most need assistance to meet the costs of studying. On a positive note, the low uptake of the PTFL across all courses suggests that the postgraduate loan budget may be underspent, possibly by more than £10m (This figure is obtained by comparing the total loans for the 1510 loans actually taken compared to the 5,000 predicted). This suggests that a fairer and more progressive support model could be achieved within the existing resources. The full response received by CFALP from the Scottish Government’s Education and Learning Directorate is reproduced below. This followed an enquiry regarding the actual take-up of PTFLs by DPLP and other students in 2012/13, the first year of operation of the new system. The total row in Table 1 (in blue) is added for clarity. I wrote to you on 11 March 2013 advising you that this information was not available. You telephoned and asked what options were available to you and I outlined these on 18 March, you then requested the figures based on the early 2012-13 dataset which was published in last year’s release (correct at October last year). Please refer to Table 1 for the information relating to students on Diploma in Legal Practice courses. Note: Student numbers in this table have been rounded up or down to the nearest 5 (e.g. 1, 2 round to 0; 3, 4 round to 5). The total number of PSAS students who are not on Diploma in Legal Practice courses in 2012-13 session is 1,190 and they claimed a total of £3,684,542 through the PSAS fee loan scheme. Note that these figures refer to amounts claimed and not entitlement, which may be higher in some cases. Please note that all statistics quoted in this response are based on an early analysis of 2012-13 session applications, which is published in the statistics publication “Higher Education Student Support in Scotland, 2011-12”, available here: http://www.scotland.gov.uk/Publications/2012/10/1895/20. As the response notes, the number of PTFL applications is correct as of 24 October 2012. In theory, applications for the PTFL remained open until 31 March 2013. However, the Universities generally require fees to be paid (including any PFTL contribution) at or before matriculation. As the 2012/13 DPLP courses start in September 2012, it is unlikely that there will be any further applications received after these statistics are provided. Table 7 at the Scottish Government statistics publication referred to above demonstrates that the October figures for all student support for 2012/13 is in line with the expectations from previous figures, providing further evidence of this. The PTFL, a loan towards fees of £3,400, replaced the Postgraduate Student Award Scheme (PSAS) which provided a grant of the same amount to up to 300 DPLP students. The cost to the Scottish Government of a loan is around one-third the value of the loan, whilst the PSAS grants were funded directly from the Scottish Government budget. The transition to the PTFL and the low uptake of additional funded places together represented a saving to the Scottish Government of nearly £700,000, around two-thirds of the 2011/12 spend on support to DPLP students. Following last month’s presentation to the Council of the Law Society of Scotland of the joint paper on Fair Access to the Legal Profession, the Council have launched a new study into the barriers facing aspiring solicitors. This follows consideration of the joint paper by the Society’s Education and Training Committee, whose responses were considered by the full Council at their meeting on Friday 26 April. To adopt a clear policy aim that the route to qualification should not be dependent on an individual’s ability to fund their professional education and training. To establish a review with a remit to identify, investigate and evaluate options for reform of the route to qualification capable of delivering this policy whilst meeting the needs of the profession and legal employers; and to report back to Council with recommendations within a defined timescale. That a “stress test” review which incorporates a review of the financing of the DPLP should be carried out with specifics of the review being considered at the May Education and Training Committee meeting, reporting to the May Council meeting, to allow sufficient time to be devoted to the scoping of such an exercise. It is hoped that any such project would be complete by November 2013. To continue to lobby the Scottish Government to extend means-tested student maintenance loans to students studying the DPLP as the only short-term solution to the fair access issue. That the Society should continue to lobby government for improved funding for all DPLP students. That the Society should consider how and when it might be possible to monitor the socio-economic diversity of the profession and those aspiring to enter it. That the Head of Equality and Diversity and the Registrar’s team should consider if and how socio-economic data could be collected and which socio-economic data should be collected. A successful legal profession must be a diverse legal profession, made up of all people from all backgrounds. It is an issue which the Society takes seriously and the Campaign for Fair Access is to be congratulated for ensuring it remains firmly on our agenda. We are obviously pleased that the Law Society of Scotland has broadly accepted the recommendations we, together with the Scottish Young Lawyers’ Association and the Trainee and Newly Qualified Society, presented to Council last month. The Society’s restatement of its commitment to the principle of fair access to the legal profession is also welcome. But, as we’ve consistently stated, the true test of the profession’s commitment to this principle will be the Society’s willingness to drive change in the route to qualification. CFALP’s position is that it is already clear that the current route to qualification is a significant barrier to fair access, an issue we’ve been highlighting now for over a year. To that extent, we are hoping that the review announced today, whose remit is to investigate barriers to the profession rather than start to formulate solutions, is only the first step and won’t delay progress towards reforms that – in our opinion – are so clearly needed. Nonetheless, we look forward to continuing to make the case for reform with the Society over the coming months. The Society’s press release announcing the study is here. The outcome of the meeting was also reported here in the Herald. CFALP would welcome comment on the Law Society’s response via blog comment, our twitter feed (@CFALP1) or our Facebook page. The following text is taken from the Law Society’s own summary of the discussions at Council from their e-bulletin dated 3 April 2013. A copy of the Society’s press release on the subject of fair access is also linked by the e-bulletin. It should be noted that the Society’s report does not reflect that the proposals and paper were jointly submitted by the Scottish Young Lawyers’ Association (SYLA) and the Trainee and Newly Qualified (TANQ) Society, rather than being a sole initiative of CFALP. A copy of the paper is published here and CFALP would welcome comments via the blog, our twitter account @CFALP1 or on the discussion on the Law Society’s LinkedIn group. The Society is to give more detailed consideration to proposals put forward by the Campaign for Fair Access to the Legal Profession (CFALP). Tim Haddow, from CFALP, presented a paper to Council members. Society Vice President Bruce Beveridge paid tribute to the campaign group and for the “rich debate” that took place at the Council meeting. The paper said: “All with the ability, character and motivation to be lawyers should be able to compete equally and on merit to enter the profession. “Personal or family economic circumstances should not be a factor working to exclude those from less privileged backgrounds. Tim Haddow argued that the cost of qualifying as a solicitor was presenting a barrier to entering the profession, particularly for those from less privileged backgrounds. Council members praised CFALP for raising awareness of the issue of access to the profession. Past President Cameron Ritchie commended the group’s paper and said it should now start a debate on the issue. The meeting agreed that the Society’s Education and Training Committee will now consider the CFALP proposals in more detail and report back to the Council in April. The Society introduced a revised route to qualification as a solicitor in 2011 following a wide-ranging review and extensive consultation. The following is the text of the paper submitted jointly by CFALP, the Scottish Young Lawyers’ Association (SYLA) and the Trainee and Newly Qualified Society (TANQ) to the Council of the Law Society of Scotland on 22 March 2013. The Council broadly welcomed the paper and remitted it to the Education and Training Committee to propose a detailed response for April’s Council meeting. It is published here to stimulate debate and discussion of fair access in the wider profession. A PDF version can be downloaded from Fair Access to the Legal Profession. This paper has been jointly produced at the invitation of the President of the Society by the Campaign for Fair Access to the Legal Profession, the Scottish Young Lawyers’ Association and the Trainee and Newly Qualified Society. All with the ability, character and motivation to be lawyers should be able to compete equally and on merit to enter the profession. Personal or family economic circumstances should not be a factor working to exclude those from less privileged backgrounds.This is not just good business sense; a more diverse and representative profession will provide better access to justice and underpin a legal system that recognises and balances the needs and interests of all sectors of society. The current route to qualification requires completion of the Diploma in Professional Legal Practice (DPLP). Studying the DPLP full-time costs over £13,000, of which students must contribute at least £10,000. Most aspiring lawyers must make this investment in the knowledge that a significant proportion of DPLP graduates ultimately fail to find a traineeship. These costs and risks present very significant barriers to entry to the profession that disproportionately affect those from less privileged backgrounds. The Law Society of Scotland should commit explicitly to creating a route to qualification that does not create barriers to those from less privileged backgrounds. The Law Society of Scotland should undertake further reform, building on the PEAT concept. The remit of the reform should be to deliver a route to qualification that maintains the highest standards of legal education and training, provides legal employers with economically valuable and competent trainees and newly qualified lawyers but which eliminates the current financial and structural barriers to fair access. To adopt a clear policy aim that the route to qualification as a solicitor should not be dependent on an individual’s ability to fund their own professional education and training. To instruct the Society’s staff to monitor and report on the socio-economic diversity of the profession generally; and of those at key stages in the process of entering the profession. This paper invites Council to adopt an explicit policy stating that access to the profession should not be dependent on personal or family wealth (“fair access”); and to initiate a review of the route to qualification aiming to eliminate the financial and structural barriers to fair access. Any reforms proposed following adoption a fair access policy will inevitably affect the providers of legal education and the recruitment and training procedures of all legal employers, all of whom are represented on Council. The role of the legal profession in society. A fair legal system is fundamental to a modern, democratic society based on the rule of law. Whether as judges deciding cases or as solicitors advising and representing fellow citizens, the legal profession is the single most important part of the legal system and its institutions. If this system is to fairly balance the interests of all, especially where there is unmet legal need, the profession must be accessible to, build connections with and win the trust of, every section of society. This needs the profession to reflect and be representative of society; this will not be possible if the route to qualification excludes or disadvantages those from poorer socio-economic backgrounds. Corporate Social Responsibility. The Scottish legal profession is an important part of the Scottish economy and a major provider of highly skilled and high status employment for some of Scotland’s most talented young people. The profession has a corporate responsibility to promote social justice and social mobility. Benefit to the Profession. Artificial limits on the pool of talent mean that law firms lose talented graduates to other professions. Equally, lack of diversity within the profession stifles innovation and hinders a broad understanding of the varied needs of clients or customers. The Diploma in Legal Practice was introduced in the early 1980s. Originally, fees were funded by a Government grant; support for living costs was available through a second, means-tested grant. This allowed those from all socio-economic backgrounds to complete the DLP. The assistance did not keep pace with rising costs or the rising numbers on the DLP / DPLP . The maintenance grant, by then of little value in real terms, was scrapped in 2010. The fees grant was capped at £3,400 and then, in 2012, became a Postgraduate Tuition Fee Loan (PTFL). The change recognised the increased number of DPLP students but the £3,400 cap remains . Each PTFL costs the Scottish Government only 31% of a grant of the same value. Part of the money released by the change to loans was used to remove the limit on the number of students supported. For 2013/14, course fees and materials are between £6,000 and £7,000, dependent on institution. Living costs depend on individual circumstances but a conservative estimate is the Scottish Government’s ‘student minimum income guarantee’ (used to set the maximum maintenance loan for undergraduates). This is £7,250 per year . The total cost of the DPLP is therefore over £13,000. Allowing for the PTFL, £10,000 or more must be contributed by the individual student. Limited charitable and bursary funding may be available to some students. A very few of the largest firms contribute to the costs incurred by their future trainees. Professional and Career Development Loans (PCDL) are available but represent commercial debt at commercial rates of interest, making them a significant financial risk even for the minority of DPLP students who have a traineeship offer before the start of the course . Over the past 5 years, 24% of DPLP graduates failed to find a traineeship ; this equates to over 40% of those who commence the DPLP without a traineeship offer . As pre-DPLP traineeship offers are generally restricted to large commercial firms, this uncertainty particularly affects those aiming to work in sectors such as criminal defence, smaller or general practice firms or law centres. These risks represent a significant additional barrier to all but the most financially secure. According to Society statistics, 15% of qualifying trainees do not gain NQ posts within 6 months. The PCDL is normally repaid over five years typically at a rate of several hundred pounds per month. The Society estimates around a third of DPLP students hold a pre-DPLP traineeship offer. Assuming all of these start traineeships, the 24% of all DPLP students is drawn only from the two-thirds without pre-DPLP offers. This equates to 44% of those students. Increased Support from Government. A return to the original 1980s student funding model for the DPLP would eliminate the financial barriers without any structural changes to the route to qualification. A more limited, but still very significant improvement, could be achieved simply and cheaply by the Scottish Government allowing DPLP students a fifth year of access to maintenance loans; this concession already exists for those training to become architects and teachers . However, significant political or public support for increased spending on legal education and training is unlikely, especially when other elements of the education and justice budgets are being cut. And whilst law plays an important public role, the profession itself is predominately in private practice. This inevitably raises objections from some to the state funding the training of lawyers other than those it will itself employ. Increased Support to Students from the Profession. In Scotland, it appears fewer law firms contribute towards the training of their prospective trainees then elsewhere. Whilst more firms taking this approach would be welcome, many firms are not, and will never be, in a position to recruit prospective trainees 18 months in advance and invest significant sums in their training without any compensating immediate benefit to the business. Improve Uptake on the Alternative Routes to Qualification. The Society exams provide a non-LLB route to qualification. This is a valuable route for those who elect not to attend University and demonstrates that work-based legal education can work. But it is unlikely to be an attractive alternative to University for significant numbers of school leavers who could otherwise obtain a University place . The part-time DPLP provides a useful option for a small number of students and again models how full-time work and professional education and training can be compatible. However, for many graduates, working – probably in non-graduate employment – for two years to pursue a qualification that others achieve in one will be extremely unattractive compared to other graduate career options. It is unlikely that any of these options can be relied upon to deliver a comprehensive solution to the financial barriers created by the current route to qualification. CFALP has been lobbying the Scottish Government on this issue for more than a year. Despite support from politicians of all parties and NUS Scotland, among others, the Scottish Government has consistently refused to increase support to DPLP students. The falling numbers taking this route probably reflect the social and political premium now attached to university level education for the brightest pupils regardless of socio-economic status. The Grange Report (2006) found 17% of solicitors aged 36-45 qualified via the Society examinations but only 5% of those under 35. On the 2012 DPLP at the Edinburgh Centre for Professional Legal Practice, only 1 of 133 students had qualified via the Society examinations. This paper aims to establish the need for reform, not determine the nature of those reforms. It is accepted that formulating reforms will not be a simple or straightforward process. Options for reform will need to be identified through discussions with stakeholders and comparisons with other professions or jurisdictions, prior to being carefully investigated and evaluated. Comprehensive dialogue will also be required with all relevant stakeholders including legal employers of all types and current and potential providers of legal education and training. Integrated DPLP and Traineeship. LLB graduates would be recruited directly by legal employers. They would then complete a modular DPLP by block release over the course of a longer traineeship. A flexible system may allow different employers to strike a different balance between a trainee’s training commitment and business contribution, accepting this may influence the time taken to qualify. A training model similar to this underpins qualification as an accountant. Include DPLP Outcomes in Undergraduate Education. Several other professions (including medicine, dentistry and engineering) rely on an undergraduate degree including both academic and skills-based learning. Bringing law into line with these other professions, perhaps through a five-year LLB, would bring all legal education into the more generous undergraduate student support regime. The last, and only recently implemented, review of the route to qualification resulted in the Professional Education and Training (PEAT) concept. This documented the outcomes to be delivered by the DPLP and Traineeship (PEAT Phase 1 and 2 respectively). The further review proposed does not seek to re-open PEAT. In contrast, a clear set of outcomes for legal education and training provides a necessary framework for reform addressing the structure and funding of the route to qualification, rather than its start and end points. Any review will need to be careful, thorough and comprehensive. Equally, careful definition of remit and a clear plan, with timescales, will be required to drive a process that can deliver within a reasonable time. The exact structure of any review is a matter for Council, as advised by the Society’s executive staff. However, it is proposed that any working group coordinating the review should include those able to represent aspiring lawyers as well as those representing legal employers. The groups authoring this paper would be keen to contribute to any review. It is proposed that any review includes a scoping period in which the working group would: establish the remit and boundaries of the review; list stakeholders and consultees; identify alternative qualification models and cross-jurisdiction or cross-profession comparators for further investigation; and create a firm project plan for the review with reporting timelines. On completion of this scoping activity, the working group could report to Council and gain approval to continue to the main phase of the review. Any review will inevitably take a significant period of time if it is to provide a comprehensive and robust analysis of the options for reform and make credible recommendations to Council for change. Formulating a more precise estimate of time may be possible during any scoping period but it is anticipated that, after allowing for a scoping period of 9-12 months, the review may take 18-24 months to complete. Implementation may well require a further 2-3 years given the challenges of making major structural changes to the system of training across the profession. Continued Lobbying on DPLP Funding. The implementation of any reform will inevitably take a number of years. Until this is complete, the current system will continue. The Society should continue to lobby the Scottish Government to resume its previous role in assisting those from the poorest backgrounds to undertake the DPLP. Although the political difficulties of making this argument have already been discussed, the Society will have considerably more moral authority in making this argument as a short-term solution to the fair access crisis if the Society has itself committed to long-term reform that will generate a sustainable solution that does not depend on state funding. Monitoring. The Society should monitor the socio-economic diversity of the profession and, particularly, the profile of those training to enter the profession. It is suggested that the socio-economic background of those applying for entrance certificates and those applying for full practising certificates should be monitored. Ideally, the Society would cooperate with the Universities to ensure a comprehensive picture can be created of the profile of aspiring lawyers all the way from LLB, through DPLP and into the profession. Next month’s Council will decide whether to adopt an explicit ‘fair access’ policy and initiate a review of the route to qualification to deliver fair access. At the invitation of the President of the Law Society of Scotland, a joint paper prepared by CFALP, the Scottish Young Lawyers’ Association (SYLA) and the Trainee and Newly Qualified (TANQ) Society was submitted to the Law Society of Scotland Council at their meeting this afternoon (22 March). The paper invited the Law Society to commit to, as an explicit policy goal, that access to the profession should not be dependent on an individual’s ability to pay for their own professional education and training. The paper argues that the current route to qualification does not deliver this policy, and invites the Society to commit to a review of the route to qualification that will. Tim Haddow, CFALP Campaign Coordinator, was invited to address Council and introduce the paper. Liz Campbell, the Society’s Director of Education and Training then responded on behalf of the Education and Training Committee. A wide-ranging debate then followed with several important contributions from Council members. At the conclusion of the debate, Council agreed that the paper should be remitted to the Education and Training Committee for detailed consideration. The Committee was instructed to report back to next month’s Council meeting with a recommendation as to the Council’s formal response to the decisions and actions that the paper invites Council to adopt. Council also asked the Committee to report back next month with proposals to for an initial scoping review along the lines suggested by CFALP/SYLA/TANQ that would report back to Council in 6 months’ time. CFALP, SYLA and TANQ are grateful for the invitation to submit our paper and to prompt debate on what we see as a really important issue for aspiring lawyers, for the future of the profession and for society generally. I was encouraged by the supportive response from Council and the clear recognition of the financial hurdles faced by those from less well-off backgrounds aspiring to become lawyers. The vast majority of contributors accepted that there was a need for change and I’m pleased that the Education and Training Committee has been asked to look in more detail at what the Society’s response should be and that this will happen quickly. As I said during the meeting, I appreciate that change will not be simple or straightforward, so I can understand the concerns of those who felt that it is too soon for further review or that change may be difficult to implement. But if the profession resigns itself to the status quo there is no doubt in my mind that it will continue to exclude many of Scotland’s best and brightest young people, simply because they cannot afford to convert their law degrees into a legal career.